It's been a busy three months, but a very busy seven days around winter quarters. We had to redo and repaint all our signs and banners because of the harsh weather back east they received in the 2010 season on Reithoffer. This year, with our signs, we put a sixty coat resin. It's like Shellac, but clear. We painted the backs with a good enamel. We had to recreate and fix a couple of 40 year old ticket boxes I got from Circus Vargas. These were built and owned by Ward Hall. We added diamond plate to the ticket box bottom for the first time. I personally repainted my entire ticket box because my father, my wife, my logo and Happy the Clown are featured on it. We had to rebuild the bottom of the entire ticket box and add aluminum to protect it. Since we were up 6 months at our local swapmeet with two of our large shows, I had to take all our sidewall into the canvas company for repairs. Krystine spent the day at the machine fixing our flags. We will get a half season out of her repairs because that's about when we expect to both have the money and see a Showman's Supply Truck. We had to wash all the tents. That was a real job because one of them was 4000 square feet. We also had a 15 foot rip in the same tent... It's amazing what they could do with a heat gun and their giant machines to sew through webbing and the heavy vinyl. We fixed cabinets and circus wagons and repainted them. We've had to use rivets and aluminum on a door to one of our horse trailers since it was jacknifed on our winter run. We had to take 30+ animals to our large animal vet for their anual booster shots, Coggins for the horses, bucolysis and TB for the cows and TB for the monkey. No shots for Ms. Krystine the Leopardess except TJV-- tequila, jagermeister and vodka. Our neighbor, Mr. Jones, and that's his really last really real name, fixed my running lights, tail and clearance lights on my trailer. Really fixed them. We don't need to run a hotwire to make it work. Hopefully we will not get stopped as easily by DOT or Highway Patrol. I am more thrilled about this than the repainting of my banners signs and ticket boxes and all the bearings repacked and regreased on our trailers. We will be leaving early Monday morning once we get the TB results from our vet. It's been in the low 90s the last few weeks here in South Texas, but tomorrow there's a cold front coming in and the weather should be in the middle 70s with our first chance of rain in six months (ice in February for one day excluded). 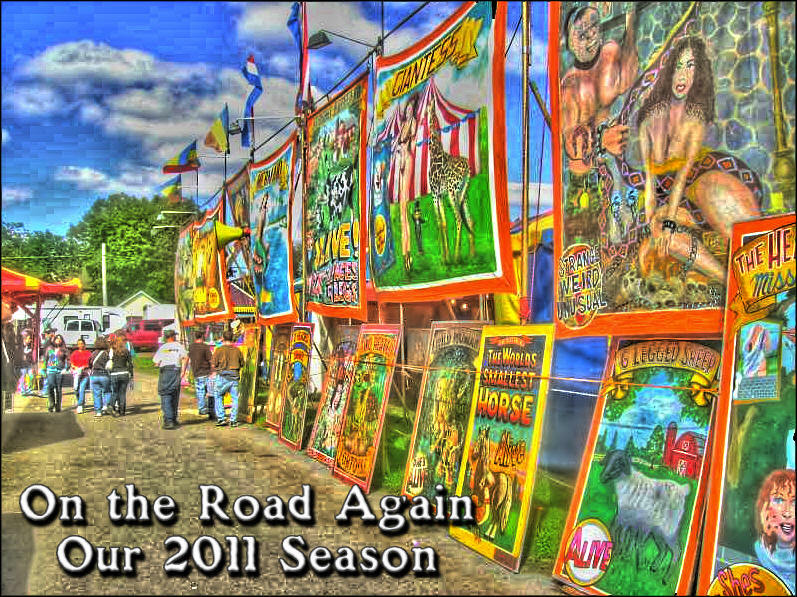 We will be stopping in Corpos Christi to visit my good friend and partner in crime, JZ and the Big Circus Sideshow. We're picking up an older gas stake pounder since JZ has built an upgraded hydraulic stake pounder. At 50 plus, this is a welcome relief of pounding stakes for me and my righthand man. Our first stop will be West Texas, a 650 mile jump, for a 3 day cinco de mayo festival. We're praying we're going to have good weather because this is what's supposed to finance our drive to Coney Island. With gas prices up to and more than $4.20 a gallon (no Marlow, not that 420), we're going to need a lot of expense money. We always have the credit card, which we thankfully paid off last season. However, my wife is really reluctant to use it. If she had her way, we would be in winter quarters all suummer. She's very scared of the gas prices and business this year with the people falling into the fairs because of the high gas prices this year. From West Texas, we drive to Brooklyn and open with the Reithoffer Shows and open at the Kings County Fair. This same week we're supposed to open three shows in Coney Island. One next to the new Zamperla Scream Zone entrance. Another show on Surf Ave near the entrance to the new Zamperla park and another on 12th St. and the Bowery. This is going to be really interesting how we're going to set up a 4000 square foot show on Reithoffer with a 150' rag front and have enough equipment and flash for another three shows. I'll possibly pick the best of the locs and go for just two locations in Coney Island. If you don't have family on the ticket boxes, it's a lot of work for very little. I just got the okay for our new amusement park to open the first week of October near our home in South Texas. We'll have a complete family circus, two 100' bannerline midway rag front shows, eight kiddie rides, petting zoo, cotton candy trailer, pony ride and three games of chance. Also a Hollingsworth dark ride as the one adult ride that I just purchased for our halloween themed event. We also will have two other sideshows at our normal major swap meet going at the same time. We have a freeway location with a good location, good visibility by a billion dollar outlet mall in the middle of all the action. We also have use of a house on the property for the office and advance work, the most important part, and six garages for stock for food and novelty concessions. All of this is gated with 10' high barb wire and 20' roll fences. Also parking for 2000 cars. Our Amusement Park will be open for a seven month run. In one location. From October to May. This is going to be an exciting season that will seem never to end.